"The Mother House is the centre of animation and co-ordination, a place of meeting and renewal." (Constitutions) That is certainly the case this summer. The following are the various gatherings and meetings that will take place at the Mother House during the months of June, July and August. 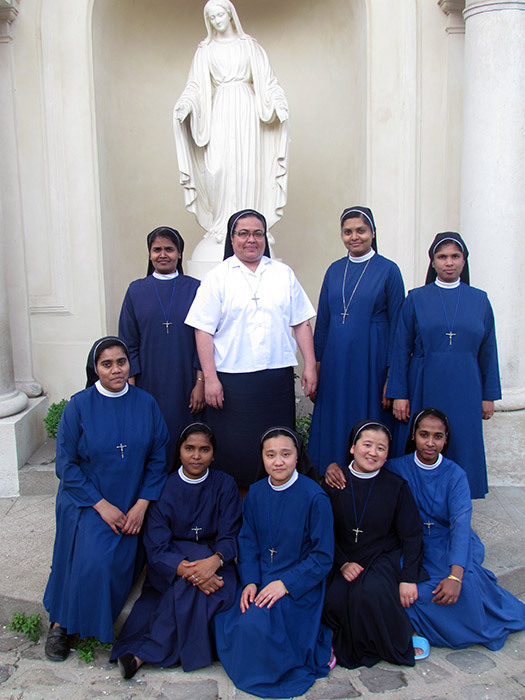 Retreat in English for the 8 Junior sisters from India who are on mission for 2 years at the Mother House, Antony, Thiais, and Spain and 1 Junior sister from the French Pacific studying in Paris. A group of 52 sisters from India and one sister from Ireland will participate in a ‘Pilgrimage to the Sources’ which will include the Mother House in PARIS, along with the towns of CHAMBLANC and CLUNY where the congregation has its roots. The entire General Council will be together for these 10 days for meeting / planning. A group of 12 sisters representing the Provinces of SPAIN, PERU/CUBA, and PARAGUAY/ARGENTINA will take part in ‘A Pilgrimage to the Sources’. It will include time at the Mother House, a retreat from the 5th to the 13th of July, and as always, a visit to the areas of Chamblanc and Cluny ... including Jallanges, Seurre and Souvans … truly, the ‘cradle’ of the congregation. 10 French speaking Junior sisters representing the Provinces of CENTRAL AFRICA, MADAGASCAR and SENEGAL / NIGER-BURKINA-TOGO will be at the Mother House to do their preparation for perpetual vows. This session will include a ‘Pilgrimage to the Sources’ and a retreat at Cluny given by Père Georges Auduc, well known throughout the congregation. The General Council will host a “Formation Session” for sisters throughout the congregation involved in the formation of novices and junior sisters. We welcome each and every one and we invite you to keep each of these events in your prayers.